A small seaside town nestling alongside Morecombe Bay, Grange-over-Sands is the perfect place for a romantic weekend of respite. With rejuvenating sea air, gorgeous landscape ideal for walking and a range of small independent retaliers, it is a quaint and picturesque town best suited to city-dwellers looking to "get away from it all" and recharge. 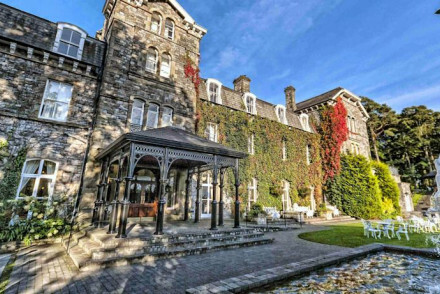 Check out our collection of the best places to stay in Grange-over-Sands to find out more! Starting life as a small and remote fishing village, it became a popular holiday destination in the Victorian era with the onset of the railway, beckoning wealthy visitors with its refreshing sea air and old-world charm. It was even once believed that Grange's salty sea air had healing properties, particularly for people plagued with advanced tuberculosis! As you stroll down the mile-long seaside promenade, you can see why the Victorians - before the onset of modern medicine - believed that the sea air had such powers. The rolling green Cumbrian countryside surrounding the town boasts great hiking spots like Hampsfield Fell - a 222m high hill - where you can get breathtaking views of the town, sea and countryside. You will undoubtedly see lots of birds in the area: Cumbria has the benefit of many nature reserves, so bird enthusiasts will love it. For a quiet walk, consider heading to the Ornamental Gardens - the pride and joy of Grange-over-Sands - a placid lake and woodland teeming with wildlife. The independent shops are delightful in the town, making it appear that all the trappings of 21st century life - faceless mega corporate chains dominating every high street - have yet to arrive in Grange-over-Sands. One such example is Higginson's of Grange, an award-winning butcher and pie maker, a place you should be sure to visit. For a fun day out, check out the Cartmel Racecourse and (intrepidly) place a bet on a horse! Finish your day by visiting the gorgeous gothic revivalist St. Paul's Church, a Grade II-listed building built in the 19th century. Place a bet on a horse at the Cartmel Racecourse! Go birdwatching in the hills above the town. Take a romantic, rejuvenating stroll along the seaside promenade! Hike up Hampsfield Fell, a 222m high hill above the town. Buy some locally-sourced, award-winning pie from Higginson's of Grange! After a heavy day of sightseeing, take some respite in St. Paul's Church. A picturesque seaside town offering warmth and respite to the keen visitor, Grange-over-Sands is the ideal place for a romantic break. Check out our collection of the best places to stay in Grange-over-Sands to find out why! Bay Villa: seemingly stuck in a time warp, this stunning B&B is the perfect place to escape to. Snug and intimate, the 3 elegant suites are adorned with antiques and boast amazing sea views. Grange Hotel: an old-fashioned hotel decked in genteel Victorian style, offering ornate rooms decorated with antiques and heavily-draped beds. Guests can enjoy the indoor pool, fabulous restaurant, jacuzzi and pampering spa. The perfect stop for rest and respite! Our partner Booking.com has a wide range of cottages and apartments in the nearby area. The best time to go is during the summer, when the temperature ranges between 11 and 19 degrees. Fly to Manchester Airport and get a train to Grange-over-Sands. A classy, discreet B&B with just three suites furnished with antiques, and with mesmerising sea views. A perfect bolthole in a genteel time warp seaside resort. Great walks - The surrounding landscape is full of fantastic walking routes. Sights nearby - Visit historic houses such as Holker Hall and Levens Hall. Birdwatching - The Lake District coastline is a haven for birdwatching. One of a kind and full of character: old fashioned, genteel Victorian hotel. 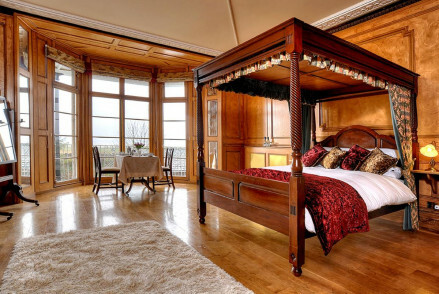 Ornate rooms with heavily draped beds and antique style furniture. Beautifully manicured gardens. Blissful indoor pool, jacuzzi and extensive spa. Fabulous restaurant. Wonderfully romantic. Local exploring - Set on four acres of landscaped parklands boardering the Lake District, yet within the town and convenient for exploring. Great walks - Endless walks in the fells, tarns and lakes of the National Park, plus the hotel will pack you a lunch. Sights nearby - Entertain children at the Beatrix Potter Experience, a wonderful family outing.